Today is my day to post as a DT Member, a Pinquette for Pinque Peacock. 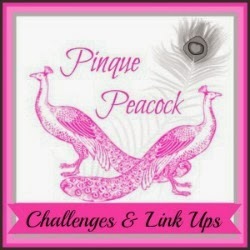 I will be posting on the Design Blog and on the Challenge Blog!! The challenge this month is anything goes!! I decided to pull out a a plain Kraft Gift bag and decorate it! Love this bag idea Heather!!! It turned out fantastic!!!!! I love how this turned out. How quick one can take a plain paper bag and turn it into a marvelous gift bag. Beautiful!! Just beautiful Heather..I want to make some bags..
Heather, your gift bag is adorable! Love your gift bag, the Elegant Floral and stick pin are gorgeous! I love this gift bag. It turned out so cute and I bet whoever gets it will love it!